On the nose this natural sweet wine presents loads of citrusaromas, especially tangerine, hints of tropical fruit and delicate notes of honeysuckle. On the palate the wine has a tremendous fruit core with an explosion of kumquat citrus, lots of concentration and good balance. 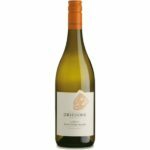 This wine finishes with a fresh citrus zest that does not leave a cloying sweetness. Ageing potential: Enjoy now. Will age with much complexity for the next eight to 10 years.